Swimming Canada believes that everyone in the sport has the right to enjoy the sport at whatever level or position they participate. Athletes, coaches, officials and volunteers have the right to participate in a safe and inclusive training and competitive environment that is free of abuse, harassment or discrimination. Swimming Canada believes the welfare of everyone involved in the sport is a foremost consideration and in particular the protection of children/athletes in the sport is the responsibility of each individual, member and special interest group in the swimming community. 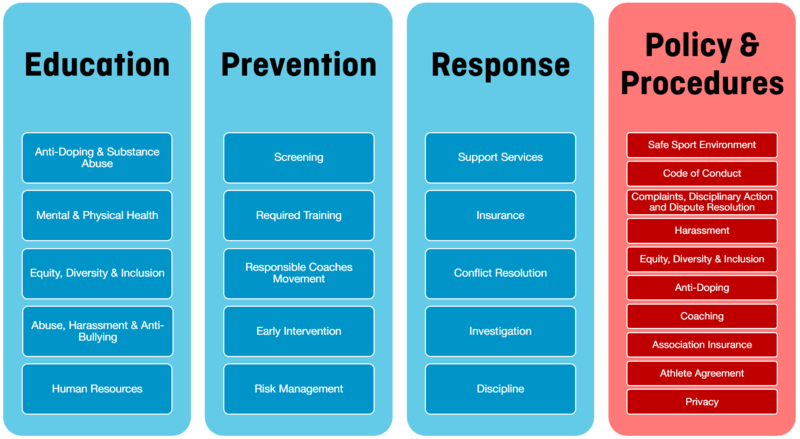 The Swimming Canada safe sport program will focus on three key areas: education, prevention and response, all of which will be supported by strong governance, policies and procedures. The goal is to ensure that all members and registrants of Swimming Canada, at all levels, have the resources to provide and access a fun, healthy, inclusive and safe environment. This program is made possible by the Canadian Olympic Committee, the Government of Canada and the membership of Swimming Canada.